On Friday, the clients of charitable organizations saw a facelift: weeded gardens, fresh coats of paint and suds dripping off clean windows. It’s all thanks to the United Way Day of Caring. In the program, 24 teams comprised of over 200 volunteers spruce up local agencies, donating their time to support community organizations strapped for resources. 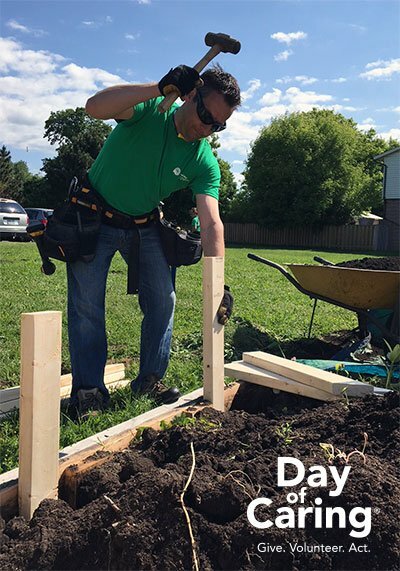 According to Bhavana Varma, president and CEO of United Way KFL&A, the day has two benefits: it introduces volunteers to the community and it helps the agencies catch-up on maintenance. A touch-up could make all the difference after a year of wear in a “well-loved” building, according to Fyfe. She said it also benefits the clients that call the place “home” and have come in every day for years, picking up basic supplies, food, or simply staying somewhere warm. “It’s personal. It’s a coat of paint but it is … an acknowledgment that they exist,” she said. According to Michelle Finney, chair of the Day of Caring, a cleaner look can also make the service a more accessible resource in the community. “Somebody may look at this and say, ‘well, why are we in there painting? That’s not helping the agency,’” she said. It eases the barriers of visiting community services, she said. Since the first time she participated 18 years ago, the program has grown considerably from its original 9 volunteers. Local businesses and retailers have increasingly pitched in to provide paint, soil, pressure washers and some extra cash. If not working on the Day of Caring, some volunteers serve meals or even put their business acumen to work and offer financial literacy workshops in a youth shelter. Meanwhile, volunteers like Sylvia Bigger put their hours in, offering a facelift for agencies in the community in any way they can. At St. Vincent, she couldn’t reach the trim along the walls so she taped a paintbrush to a broomstick. All things considered, “why not?” she said.